Brazil has some of the tastiest treats on the planet. Current South America traveler Russ Slater gives us a primer on what to know before digging into ten of Brazil’s best dishes. This, served with rice, is the number one dish in Brazil. Feijão is black beans that have been boiled with onion and garlic. 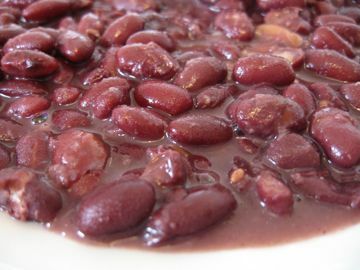 Sometimes the beans are cooked with pork, in which case it is called feijoada. Farofa on top of feijão with a helping of rice is sublime. These dishes will generally accompany any meal that you have in a Brazilian restaurant and will always be in abundance at the all-you-can-eat and per kilo restaurants. 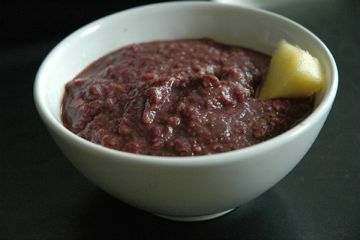 Elsewhere in the world açaí (a berry-like fruit) is criminally expensive and normally exists as a powder mix or concentrate. In Brazil, it can be found on every corner, available as a juice, milkshake, ice cream or blitzed up with granola for a special treat. Argentina gets all the glory for great barbecue but Brazil can offer more than ample competition. Their sirloin (picanha in Portuguese) is a beautiful thing – a huge lump of meat covered in rock salt cooked high over a barbecue tenderized to perfection. You will need to go to a churrascaria to get this but beware: Asking for a complete churrasco will mean you get every last piece of the animal barbecued, from the chicken’s heart to the pig trotters. There are so many types of passion fruit in Brazil that each one has its own name. Maracujá is by far the best. Chopped in half and eaten with a spoon it will provide a blast of citrus-y goodness. It also makes a good alternative to lime in caipirinhas. Cajú. Yep, that’s some strange fruit. 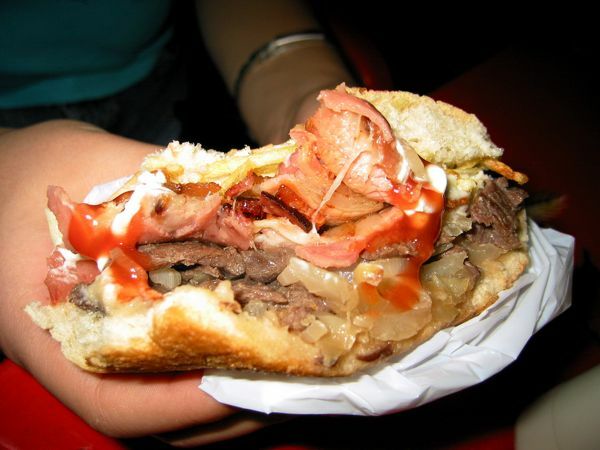 Snack food in Brazil almost exclusively consists of fried parcels of meat. Coxinha is a personal favourite; a cone containing chicken at the top and mashed potato at the bottom, with a flour coating. It is especially good with catupiry (cream cheese), which is sealed inside the coxinha next to the potato. One of these is enough to keep hunger at bay for a few hours. On long journeys, their presence at every service station is a godsend. This is a classic pudding made from condensed milk, fresh milk, eggs and sugar. It is a circular dessert of white jelly-like sweetness with a caramel-style bottom. They are available as tiny snacks or as huge puddings which can be taken home for all the family to enjoy. Made from yams and fried as cubes, aipim frito are very similar to chips, yet with a tougher consistency. Very good with salt and ketchup! Brazil loves cake, which they call bolo. In fact, it is one food that can be eaten at any time of the day. It is available at restaurants, corner shops, street vendors and generally any place that sells any type of food. Bolo is often made with corn flour (polenta) instead of wheat flour and is sometimes made with a combination of the two, giving it a different texture entirely. Try flavors like chocolate, pineapple and coconut. I have mentioned coxinhas but perhaps even more popular for snack food are pastéis. These are very similar to empanadas or pasties and will generally have a beef filling. They can be bought on the street ridiculously cheap but can also be bought in restaurants, where they offer a huge variety of flavours. Empadas are also worth trying. These are cooked in the oven and are like a tiny pie. They will normally have the same fillings as pastéis, but will often also have a vegetarian option. The cajú fruit is perhaps most well-known for giving us the cashew nut, but it’s quite a tasty fruit itself. It can be eaten whole but my preference is mixed in a juice as solo it can be a little bitter. 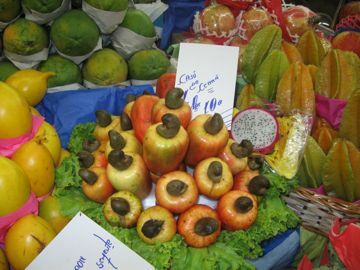 You will recognize the fruit in shops, as it will have what looks like a giant cashew nut attached to the top of it. When the nut is in this state it is highly allergic to eat and will most likely bring the devourer out in a horrible rash. The nut it needs to be roasted before you can eat it.